Come experience Fiji’s rich culture, breathtaking eco-adventures and legendary soft coral diving at this popular dive resort on the beautiful island of Taveuni. Ocean-view Room – 15 well-appointed rooms are upstairs with private balconies. Sleeps up to 3 (additional charge for 3rd guest). Oceanfront Room with Outdoor Spa- 15 larger rooms on the ground floor with a private outdoor patio featuring a Jacuzzi spa. Sleeps up to 3 (additional charge for 3rd guest). Award winning Garden Island Resort is well known for its excellent dive staff and world class diving location just 15 minutes from the White Wall and 25 exciting dive sites. 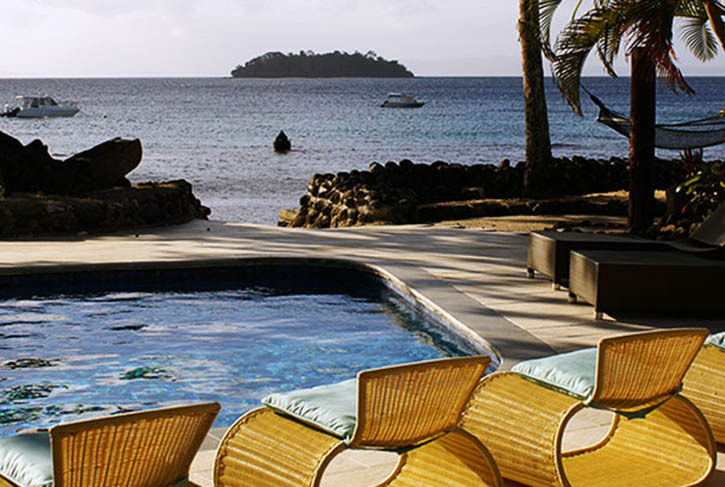 Come dive with Garden Island Resort, located on the doorstep of Taveuni’s legendary Rainbow Reef! Famously known for having the finest soft coral diving in all of Fiji, this area includes patch reefs in Somosomo Strait and the fringing reef on the southeast corner of Vanua Levu. On the patch reefs diving is fairly shallow (30 to 70 feet), but there can be challenging tidal currents. At the fringing reef section diving is wall diving with deeper profiles (50 to 100 feet). A typical dive involves mooring, briefing, descent down a line, and a guided tour. Drift dives are done when site and tide conditions are favorable. Diving in the legendary Rainbow Reef is a unique experience, like nowhere else in the world. Beneath the surface of the sea lies an incredible eco-system that rivals the rich bio-diversity found on land. The daily tidal currents in Somosomo Strait produce a constant flow of nutrients that provides ideal conditions for soft coral growth, as well as sustains an incredible diversity and density of tropical fish life. The fringing reef area provides opportunities to experience larger fish and drop-offs. If there is one trademark or signature species in the area, it is the multi-hued soft coral, which billows and undulates in the currents. Soft coral comes in dramatic, often electric hues of orange, red, pink, and white-fringed by purple. There are a number of world class dive sites located throughout the area and new attractions are found all the time. It is estimated that divers have explored only 3% of the entire reef system in the Taveuni area. The currents can be challenging in the Somosomo Strait. Depending on the state of the tide there can either be strong incoming or outgoing flows. Also, due to the unique topography of the strait, the current actually flows over as well as around the reef. The upshot is that the stronger currents are in the shallower sections of the reef. Once down on the reef there is considerably less current. The best advice is to listen to the dive crew as they are the experts and know the sites intimately. Garden Island Resort is the first Gold Palm Resort to be awarded by PADI Australia in the region. This award recognizes PADI International Resort Association members that present a professional image, and demonstrate excellence in customer satisfaction, dive experiences, educaiton, safety and environmental awareness. The dive shop offers daily dive excursions to the Rainbow Reef and a full range of PADI dive courses. Where will we be diving? Most dives at Garden Island Resort Taveuni are at the world famous Rainbow Reef. This area includes patch reefs in Somosomo Straits and the fringing reef on the southeast corner of Vanua Levu. The distance to the majority of sites from the resort ranges from 10 to 30 minutes by dive boat. On the patch reefs diving is fairly shallow (30 to 70 feet), but there can be challenging tidal currents. At the fringing reef section diving is wall diving with deeper profiles (50 to 100 feet). A typical dive involves mooring, briefing, descent down a line, and a guided tour. Drift dives are done when site and tide conditions are favorable. What can we expect to see down there? Rainbow Reef is famous for its multi-hued soft coral. The daily tidal currents in Somosomo Straits produce a constant flow of nutrients that provides ideal conditions for soft coral growth, as well as sustains an incredible diversity and density of tropical fish life. The fringing reef area provides opportunities to experience larger fish and drop-offs. What determines the day's dive locations? Two factors determine the dive locations; tides, weather. The dive guides have learned over the years that certain sites are at their best on certain tides, incoming or outgoing, while some can be dived on either tide. The Ocean in the Somosomo Straits is generally sheltered from rough seas but can be affected by surge. The fringing reef area is more exposed and sometimes we are unable to dive there due to choppy seas and strong surge. Over a week's period you will probably have experienced a range of dive sites including the better known ones such as the Great White Wall and Blue Ribbon Eel Reef. We cannot guarantee particular sites due to the two reasons above. Please keep in mind that there is no such thing as the "best" dive on the Rainbow Reef, however, there is the best dive that day depending on the conditions. The dive guides will always try to dive the best dive sites available. What is the water temperature and what exposure protection will I need? There are two distinct seasons for diving: summer (November - April) and winter (May - October). During the summer months water temperature lies in the 80°F - 82°F range (27°C - 30°C) and a lycra divesuit or a shortie is recommended. During winter the water temperatures are in the 75°F - 78°F range (24°C - 27°C), and a 3 mm or 5 mm wetsuit is recommended. How much experience do I need to dive the Rainbow Reef? Sometimes the currents can be challenging in the Somosomo Strait. Depending on the state of the tide there can either be strong incoming or outgoing flows. Also, due to the unique topography of the strait, the current actually flows over as well as around the reef. The upshot is that the stronger currents are in the shallower sections of the reef. To safely accommodate divers in this situation, our dive crew will anchor a descent line down. This enables divers to descend and ascend through even a strong current. Once down on the reef there is considerably less current. The best advice is to listen to the dive crew as they are the experts and know the sites intimately. Current diving is often made easier if you wear a few extra pounds of weight to assist in descent. What time do the dive trips depart and return to the resort? The boats ( we have two dive boats; catering to a total of 24 divers). We are able to confirm dive groups up to a maximum of 32 divers as we will charter an extra boat to accommodate the extra divers) start loading between 8:45 for a 9.00am departure. After two dives – with a surface interval at a lovely beach -- the boats arrive back at the resort at approximately 1:00 to 1:30 PM for a late lunch and a relaxing afternoon. Guests should meet no later than 8.30am at the Dive Center to prepare for the dives. Towels, tea/coffee, water, fruit and cookies are offered during the surface interval. Groups: Pay for 10, get 2 FREE! PLUS a Free Night Dive! Garden Island Resort - 2016 DIVE Special! Deposit by March 31, 2017. We are taking bookings starting today. Call us soon to get the best fare! Conditions: Travel valid through March 31, 2018. Must be under deposit by March 31, 2016. Minimum 7 night stay. Prices are in USD per person based on cash/check discounted price. Double occupancy and space available. Packages do not include most beverages. DIVES CANNOT BE EXCHANGED FOR NIGHT DIVES. Rates are subject to change due to fluctuating exchange rates until paid in full. Other restrictions may apply.